Ryan Feltham topped a seven-fish weekend haul at Linear Fisheries with this 41lb 6oz mirror. Braving the crowds at the Oxfordshire complex and arriving at 8am on a Saturday morning, the 25-year-old headed to Brasenose One and dropped straight on to fish. The Swindon angler told Carpfeed: “On arrival I turned left after the bridge and headed towards the grass bank. There was a strong south-westerly wind coming in so I pulled over straight away. “I actually noticed a friend on the first swim on the grass bank and I spoke to him while watching the water. “It wasn't too long before fish were showing at distance in front of his swim and swims towards the right. There were anglers packing up so I managed to jump straight in. Having spodded out sweetcorn and Sticky Manilla boilies, Ryan didn’t have to wait long for signs of life. He said: “For the first hour I kept having strange runs on my rods with no fish. I soon realised it was liners so I moved both rods back to 100yds. 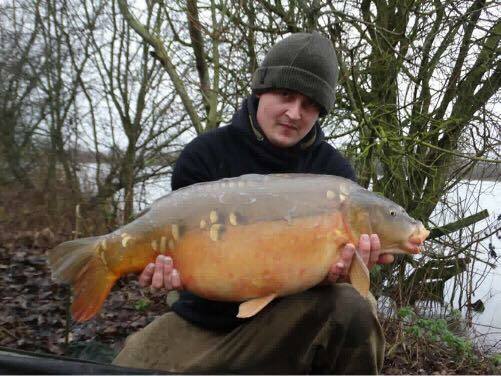 “After putting out more spods it was around 20 minutes before I picked up my first bite – a 27lb mirror. From then on the fish switched on. “After catching four fish, including a few more 20s, and losing one in quick succession over two hours, I had a 25lb common on the bank from my left rod. “While doing photos I had a heavy drop-back on my right rod. Luckily I had a friend there to attend to the common and I got to the rod. “The fish came towards me at first, eventually getting heavier and heavier. It was then I knew it was a good fish. It was a heavy fight throughout, no jerking about, just deep Lunges. Ryan fished Ronnie rigs with Sticky Manilla Yellow Ones pop-ups.